It’s cold up in these mountains- not as freezing as someplace like Minnesota or Alaska, but still pretty chilly. Half of my commute is either at night or before sunrise, so I’m riding in temperatures right around or below zero (in American temperatures) everyday. I’m not sure what the wind chill factor is blasting down a ski slope at midnight on a fat bike, but it’s probably something substantial. 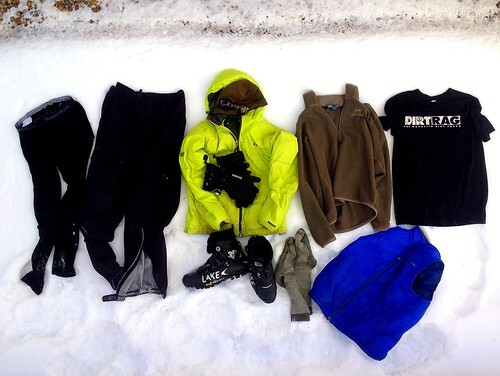 Since the rest of the country is in the midst of the polar vortex/ icy spiral of doom (ironically it’s sunny and 30 here today), I thought I’d write up the layering system I’ve figured out to make winter bike riding comfortable. In journalism class, they always told me timeliness was important. First- forget wearing any spandex. Winter cycling clothes are a joke. To keep you warm, a layer has to have loft, and be able to trap warm air from your body. Tights can’t do that. They’re also bad at resisting water, slush and all that crap. Cotton t-shirt, wool base layer if it’s staying below 10 degrees, or I’m out a long time. Puffy vest, usually stays in my bag. For really cold wind or descents. Lake boots, two sizes bigger than I normally wear. I know that common outdoor wisdom says that “cotton kills,” but I like cotton shirts, and I’m not dead yet. For most rides, a soft t-shirt makes a fine baselayer. It’s not itchy, it doesn’t stink like synthetic, and I don’t have to change it when I get to work. For longer rides, wool is my favorite baselayer. It’s naturally anti-microbial, so I can go a while (I won’t say how long) without washing the tights or socks. Your mileage may vary, I’ve been accused of being one of them goddamned dirty hippies more than once. The shell pants I wear are super simple (better), one pocket, drawstring waist, baggy, and mostly waterproof. Since they’re not totally sealed up, they breathe pretty well. I don’t feel the need to wear anything more waterproof- I’m bike riding, not crab fishing. I bought the jacket from a consignment store when we moved here. It’s puffy, bright (until it’s covered in dirt the day after I wash it), and has a hood. I never used to be a fan of hoods while riding since they restrict your vision, but I guess Pittsburgh was never this cold. Throwing the hood up when the wind starts to blow makes a huge difference. Hand warmth seems to be pretty personal. I’m fine without gloves down to 25, so ski gloves are plenty for winter riding in Colorado. Below freezing, Colleen seems to get numb hands no matter what she does. She has some poggies on the way. Hopefully those will fix her problem, because she’s out there commuting two hours almost everyday as well. The Lake MZX303 boots have been awesome. Before I got them, I was riding in some Specialized winter shoes that were half a size too small, and getting numb feet constantly. Winter boots definitely should be sized big- for around here, two sizes up is plenty. I can fit a thick sock, maybe two if I need to and the boot isn’t tight. The only thing that keeps a foot warm is circulation. Cut off the blood flow with a tight shoe, get numb feet. I passed the Specialized boots onto Colleen which worked out perfectly, because they’re way to big for her. Other stuff- unzip, or take off a layer before you start to sweat. As soon as I warm up, I start opening up vents. Sweating is bad. When sweat evaporates, it goes into your insulation, where it builds up. Then the insulation can’t loft anymore, can’t trap any heat from your body, and turns into an ice coat. Which isn’t nice. If you care, here’s some more good reading on winter clothing systems. No helmet? … stop reading. If so you can duct tape the inside of an old one if you have an extra one sitting around. Most of your heat is lost through your skull. when you can swing it get an old XC ski jacket with a breathable back. Craft or an old Sugoi. That might be too technical for you (T-Shirt and all) but long ride thermo regulation is critical. Try getting a mechanical at 0F and watch all that body heat drain away at the same time your seat starts to freeze. Big fun as your hands shake while you go hypo. Good idea on the helmet. I wear one most of the time (although I usually don’t if I’m just rolling through fluffy snow at 2mph). And I definitely understand that thermoregulation is important. That’s why I put my puffy coat and vest on when I stop, or zip them back up if I haven’t taken them off. A breathable back would be nice though. But I might take back what I said about gloves. I was out for four hours the other day, and it wasn’t very cold, just damp- but my hands froze in a bad way when I descended back to town. I may have to invest in some pogies. I like the “lobster claw” split finger gloves. They are a good compromise for cold weather/control. Pogies are nice because you can store stuff in them and wear thin gloves. I see them like fenders in a way … practical but not very sporty on a racing bike. Warm hands and dry skin trump sporty pretty quick though. You might get arguments on the helmet but it works. The other way to roll is to get a nice cold weather helmet cover but they cost more than tape. Cold and damp is bone chilling on long rides. Happy feet and hands is the key (obviously). What did you do for hydration for 4 hours? Dang. I’ll give it a try.